Study Anthropology/Sociology at Oxford Brookes University - Which? This is a combined honours course, where you study Anthropology alongside Sociology. 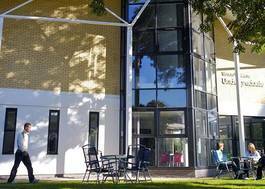 Brookes is distinctive among UK universities in teaching biological and social anthropology in tandem. Biological anthropology explores our evolutionary history, our response to environmental challenges and our relationship to the other primates, while social anthropology helps you to appreciate and respect the customs and beliefs of other societies. Brookes is home to the Anthropology Centre for Conservation, Environment and Development, and the Europe-Japan Research Centre, while other resources include the world-renowned Pitt Rivers Museum of Anthropology and World Archaeology just a mile away. An Anthropology society is also led by students. Sociology studies human social life, groups and societies. A wide-ranging subject, it analyses social relationships and social institutions, and the ways in which they shape people’s lives. Sociologists focus on many topics, ranging from global social processes to changing identities and personal relationships. Studying sociology will increase your knowledge and understanding of the social world in the 21st century. Our flexible course allows you to pursue your own areas of interest within the subject. In the Anthropology element of the course, what you study includes: Biological anthropology examines humans within a broad evolutionary framework, including variation in biological characteristics, genes, diseases, the interaction between people and their environment, and the behaviours and comparative anatomy of primates and early hominins. Social anthropology includes the cross-cultural study of social organisation, kinship and gender, political structure, values and beliefs, and social change. In the Sociology element of the course, what you study includes: Year 1 comprises two introductory modules which expose you to the fundamentals of sociological analysis. In Year 2 you decide how to build on this basis of sociological knowledge by choosing from a range of modules covering such topics as ‘race’ and ethnicity, gender relations, and work and employment. Year 3 includes a series of honours modules as well as a specialist study with the optional dissertation module. We have quite a lot of sociology graduates, although numbers fell last year. But graduates still do pretty well. Most sociology graduates go straight into work when they complete their degrees, and a lot of graduates go into jobs in social professions such as recruitment, education, community and youth work, and housing. An important option for a sociology graduate is social work - and we're short of people willing to take this challenging but rewarding career. Sociology is a flexible degree and you can find graduates from the subject in pretty much every reasonable job — obviously, you don't find many doctors or engineers, but you do find them in finance, the media, healthcare, marketing and even IT. Sociology graduates taking further study often branch out into other qualifications, like teaching, law, psychology, HR and even maths, so don’t think a sociology degree restricts you to just one set of options.